Is there anyway better to say something rather than simply writing it? And what if instead of just writing it down we actually sew it to ourself? Naa, we’re not going nuts here at DIYs. 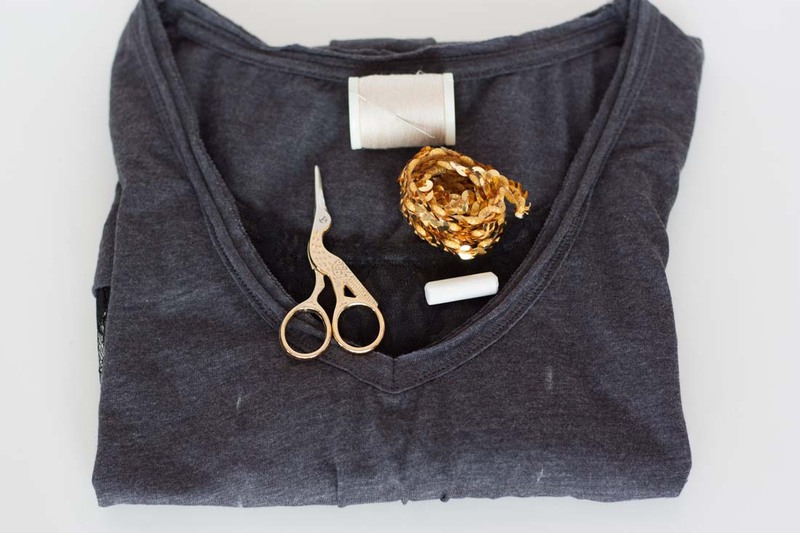 But I promise you’ll go nuts when you see how easy this sewing tutorial is! This year at Valentine’s day declare your love by wearing it. 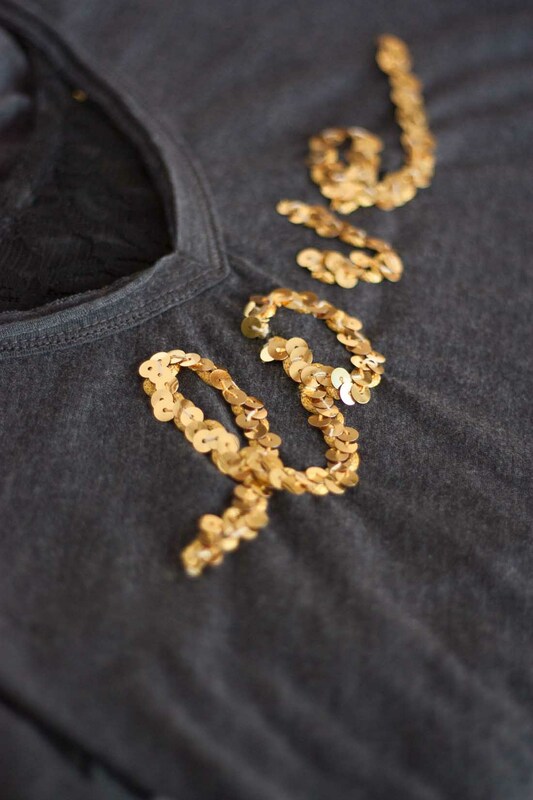 Transform a regular grey shirt with some sparkly typography, without forgetting the girlie touch! Aka, let’s make typography interesting with some gold sequin shine. 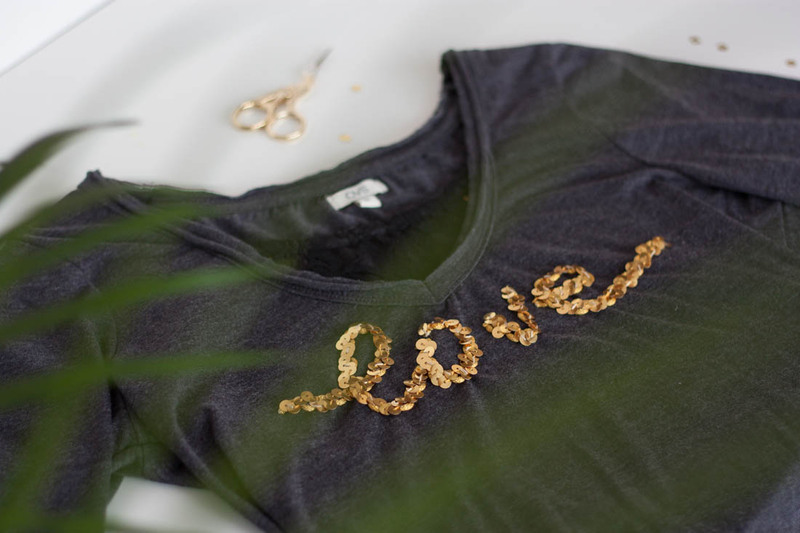 Follow this tutorial and discover how to make your own “love” sequin shirt, perfect for Valentine’s day, totally ok for the rest of the year. Neat. 1. Wear your shirt and decide the place that’ll be taken up by the type. 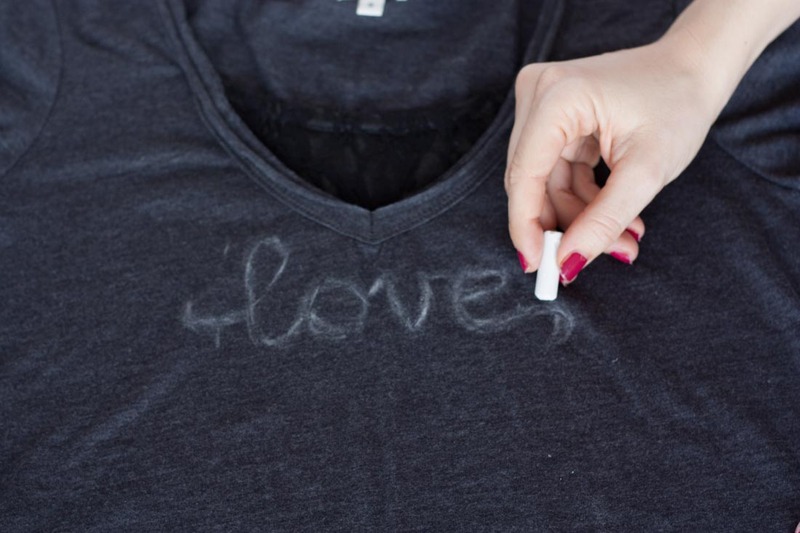 Draw small lines with your chalk. Place it on your desk and draw freehand approximately the letters, making sure the center is between the “O” and the “V”. 2. 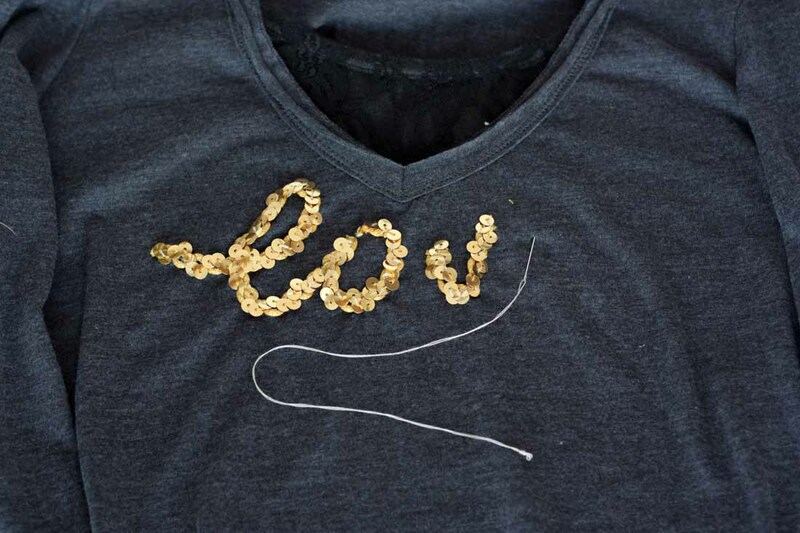 Start with the capital L, help yourself with a needle to keep part of the letter in place and sew it following your drawing. Work by sections to simplify the work and manage more simply the edgy parts of the letter. 3. Go ahead with the O and the V, and remember the ribbon does not necessarily have to be all in one, each letter can have its portion (in fact, my “L” and “o” aren’t attached, even if they overlap). 4. Finally, close with an elegant E that has a little decorating glyph popping slightly out to the right. Finally, wear your shirt proudly around him and show off your talent! In my case I also think the V neck of this long sleeve t-shirt helped me to keep the center and not go too low with the type (you don’t won’t it to appear under your breast, and neither onto your stomach!). Now that you’ve mastered the technique you can have fun and sequinize all the outfits you prefer. Sequinize is sequin-personalize in my head, it’s such a perfect word to describe the process! Such a pity it doesn’t exist. Hope you had lots of fun and ask any doubts in the comments below if any pop up in your mind.